Reflecting on My First Year of Sewing! It all started last year when one of the teachers I work with brought some of her creations to show me. 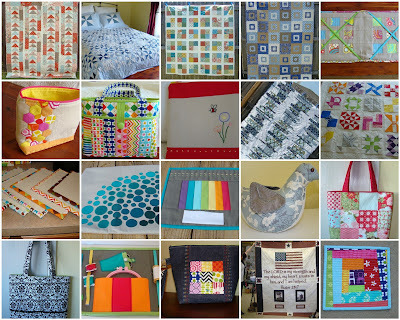 I had never touched a sewing machine until last Christmas but her projects had inspired me. I asked my mom if I could borrow her sewing machine and it was all over! I had found my "thing"! Over the past twelve months, I have tried a variety of projects trying to develop new skills. I still feel like I know next to nothing about sewing but I have loved every minute of the discovery. Here's a look at my past year of adventures in fabric. 1. My Mom's birthday quilt. 3. A Synchronized Squares Quilt from the ps i quilt sew along. 4. A wedding quilt for my sister-in-law. 6. My first swap! "Pretty Little Pouch Swap Round 2"
8. My first attempts at embroidery. 10. The beginning of my Farmer's Wife Blocks. 11. Mini Design Boards to help organize intricate blocks. So useful! 12. My second swap. Pillow Cover for "For the Love of Solids Swap"
14. My third swap. A pincushion for the "Sewn Spaces Swap"
16. My first commissioned project! An x-large tote for a new bride! 17. Traveling Sewing Kit. My own pattern, I was pleased with how it turned out! 18. My fourth swap. "Pretty Little Pouch Swap Round 3"
19. A birthday gift for my dad. He was a military guy who loves Jesus and his country. 20. Mug rug for my desk at work. My first attempt at a wonky block. Quokka Quilts has put together a great opportunity for bloggers. 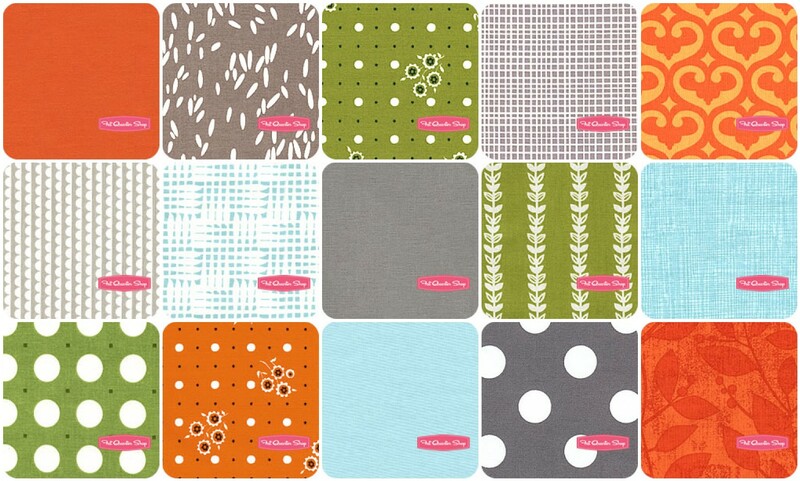 I have scoured the fabrics at Fat Quarter Shop and have come up with a group of fabrics that I would love working with! Hopefully my collection will be well received! I would love to have a bundle of these! Here's hoping! *For the fabric, I used a cream and black denim. I like the feel of the coaster after they are finished with a more dense fabric. 5" squares of the main fabric. Create the templates that you will use for the letters and numbers. To create my templates, I created a word document and found the font that matches the look that I am going for. For this project I used Arial Black. The letters are quite a bit larger than the numbers. After I printed out the letters and numbers that I would need, I glued an index card to the back of the letters and numbers to make the templates more stable. I then cut out each letter and number individually. Here you can see that the letters are backed with an index card to make them more durable. Now is when you prepare the black fabric! I am a big fan of Heat 'n' Bond. I use it for all of my applique needs! I cut a piece of Heat 'n' Bond and ironed it to the back of my black fabric. Then I traced the templates onto the Heat 'n' Bond. *Make sure you trace the templates the correct way! The right side of the template needs to be facing down when you trace! When you are finished tracing, cut out each piece and peel off the paper back. Center the letter on the front of the cream denim and iron until the letter is secure. Iron the number to the bottom right of the letter. Now it's time to applique! I pinned a piece of Pellon Stitch-N-Tear stabilizer to the back of each square. Applique around the edges of the letters and numbers with black thread. You can see the stitching from the back of the square. Tear off the excess stabilizer. 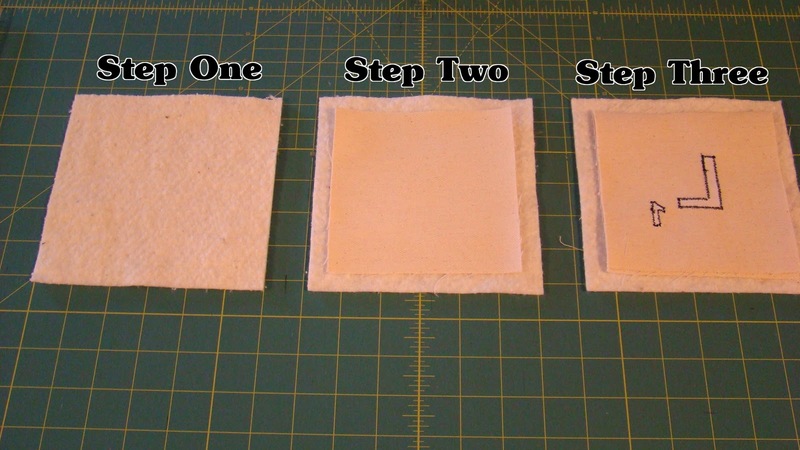 Next you will stack your blocks together to get ready for sewing! Step One: Lay down one piece of batting. Step Two: Add one 5" square good side facing up. 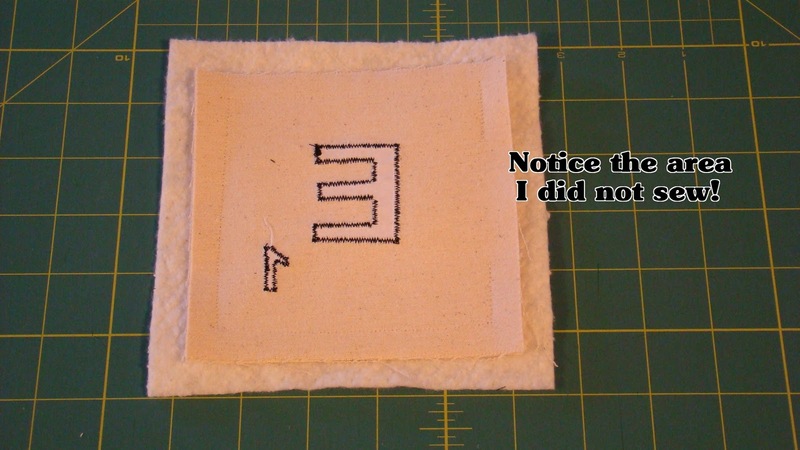 Step Three: Add one Letter appliqued square good side facing down. Now it's time for sewing. I used a 1/2" seam allowance for this part of the process. 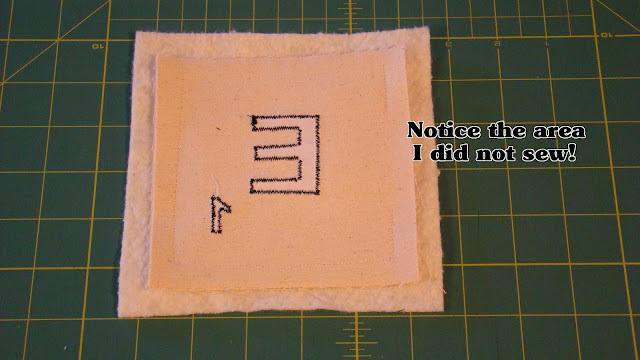 Sew around the edge of the blocks, making sure to leave a section open in order to be able to turn right-side out. Cut excess batting and trim corners. Turn right-side out. Press. Sew around edge of completed block! Finish with the remaining letters and voila! You have a completed coaster set that will look amazing in your home or work wonderfully as a gift! Hope you enjoy! I would love to see pics of your completed project! I needed a quick White Elephant gift for a church Christmas Party so I whipped up a coaster set. I added some hot chocolate mix and a mug in with the gift. The party is tomorrow so hopefully none of my church peeps see this today. My husband and I each have to bring a separate gift and he definitely didn't go the practical route! He has an amazing sense of humor, so this is what he picked up during our shopping adventures. 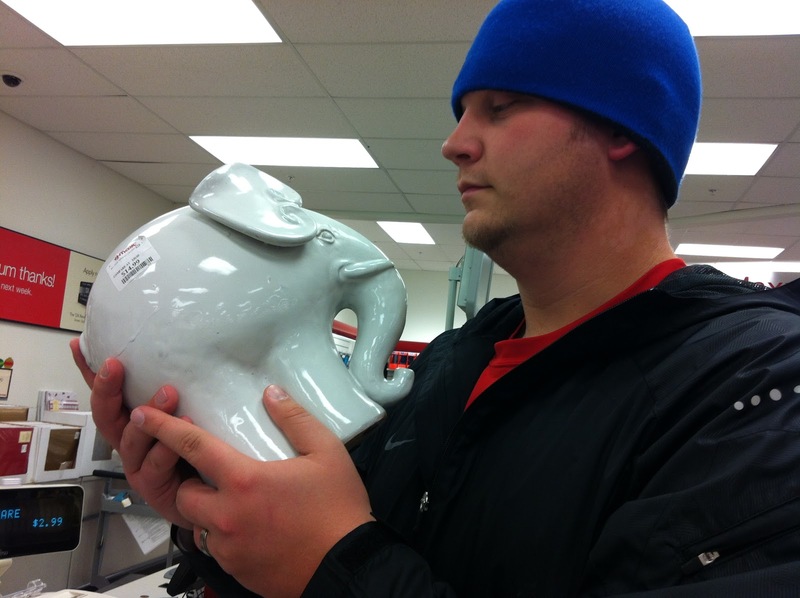 Yes, he actually bought a white elephant for a white elephant gift. I'm sure it will be a hit! There is never a dull moment with this guy! I am linking this up with Quilt Story Fabric Tuesday. It's such a wonderful way to connect with others! I have some good friends at work that I wanted to do a little something for. I decided on some mug rugs, their favorite beverage, and a snack item. They aren't anything big but at least it's another project done off my list! I hope they like them! Holy Moly! Two Giveaway wins in one week! 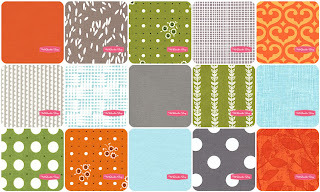 Laurie Wisbrun from the Scarlet Fig held a giveaway for some wonderful fabric and guess who won?! Me! I was so surprised to win two giveaways in one week. I actually contemplated buying a lottery ticket, but I thought I shouldn't press my luck. How cute are these fabrics? I definitely am a fan. Thanks Laurie! Look at the loot I won from Sherri at A Quilting Life! I won a Chemistry charm pack and jelly roll! Thank you so much Sherri, this giveaway was way too generous. I'm not sure what I will be doing with it quite yet but I'm leaning towards a baby quilt. Only time will tell! Thanks again Sherri!